What is PagBrasil’s Hybrid Model? PagBrasil’s exclusive hybrid model provides merchants with a combination of the company’s gateway and collection services, allowing them to take advantage of a fully flexible and cost-effective setup. With the hybrid model, PagBrasil’s clients can easily offer the broadest set of payment methods with a fully PCI DSS compliant platform. In addition, the setup comes with the great advantage of optimizing conversions, settlements and processing costs. PagBrasil’s gateway gives merchants the possibility to process payments through different acquirers simultaneously using just one API. Our system is integrated with three of the most important acquirers in Brazil: Cielo, Rede and Elavon/Stone. Therefore, switching from one acquirer to the other can be done instantly, providing merchants with bargaining power to negotiate the best fees. Furthermore, our gateway allows merchants to set filters, such as card label and number of installments, that rout each transaction to the optimal acquirer. By doing this, merchants can significantly optimize their processing costs and conversion rates. 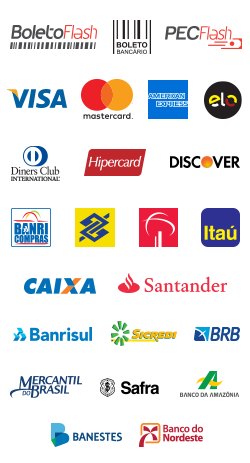 Merchants using PagBrasil’s gateway must negotiate the processing fees directly with Brazilian acquirers. PagBrasil will only charge a fixed fee per transaction for technical processing, support and platform updates. Read more about our payment gateway. Payment processing with collection enables merchants to benefit from a full service that comprehends payment processing as well as money collection. Besides an easy integration of our API, iFrame or e-commerce platform extensions, PagBrasil manages all technical and commercial aspects of payment processing, including contractual relationships with banks and acquirers, money collection, reconciliation and clearing. One API for all payment methods: An integration with only one API will give you access to all our payment methods via our gateway and collection services. Commercially motivated optimizations of the payment setup can be easily implemented with no need of a developer to change the integration. Better processing fees: PagBrasil’s payment gateway allows online businesses to switch from one acquirer to the other immediately with no change in the technical integration. Consequently, merchants benefit from bargaining power to negotiate the best processing fees. Multiple acquirer processing: Our clients can use several acquirers in parallel or combine card processing via the gateway and collection service. This is useful, for instance, when the acquirer of choice doesn’t support all domestic card labels. Lowest cost routing: With only one API, you will gain access to three acquirers and one payment service provider. This will allow you to obtain the best fee for each payment method. For example, one acquirer may have excellent fees for one-off credit card payments, but you may prefer to process installment payments with another provider. Broadest set of payment methods: PagBrasil’s hybrid model gives access to the widest range of domestic credit cards, from local to international labels. In addition, merchants can also offer their customers the option of paying with boleto bancário, which currently accounts for 25% of all online transactions. PagBrasil is also the creator of Boleto Flash®, an exclusive solution that provides payment confirmation for boletos within a two hours on business days. Alternative payment methods, such as online banking transfer and debit cards are also available in the package. PagBrasil’s platform is fully compliant with PCI DSS Level 1, version 3.2 – certified by Trustwave. Therefore, it meets the highest international standard of security for credit card payment processing. Merchants can avoid the significant complexity and cost of PCI DSS compliance. By processing through PagBrasil’s secure platform, the overall PCI scope can be significantly reduced or even eliminated. Concentration all on one platform: Resolve all your technical and operational challenges with only one 24/7 support. Consistent integration: Using PagBrasil, online stores can focus on growing their business instead of dealing with technical and operational issues. While Brazilian credit card acquirers regularly introduce changes to their parameters as well as the way of calling their API, PagBrasil’s integration only requires an initial setup. All alterations and updates to meet the changing technical requirements of banks and acquirers are done at PagBrasil’s end. Fraud prevention:The hybrid model also includes access to PagShield®, our exclusive fraud prevention solution. Integration is part of the same API and our platform is also compatible with other leading market antifraud solutions: ClearSale and Konduto. Reconciliation service: A reconciliation service is provided by default for the collection model and is an optional service for our payment gateway. Complete reporting is provided for processed transactions and pending payouts. Business intelligence: Generate a broad variety of reports and charts to analyze your business. For example, check information on conversion rates, a key performance indicator that is often not provided by acquirers, who only count approved transactions. Contact us to find out more about the hybrid model.